Hot and happening DC pizzeria that also offers appetizers, sandwiches, cocktails, beer and wine. 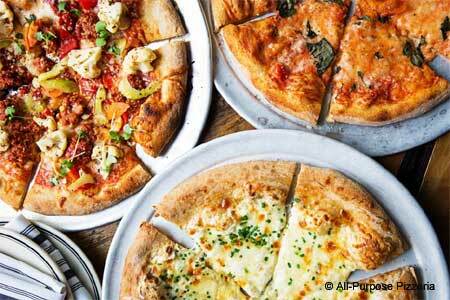 : This casual downtown DC place with unfinished walls, scuffy tiled floors and an open pizza kitchen, affiliated with Boundary Stone and Red Hen, focuses on Italian eats. Patrons can start with fried calamari (some of the crunchiest in town), marinated olives, an antipasti salad and much more. Lunchtime sandwiches include a fried calamari po’ boy, crispy eggplant and mozzarella, and sweet and hot sausages on a roll. Pizza, of course, is the big deal, and the choices are unusual, but the King’s Highway with cheeses and a pistachio-lime pesto is a winner. At dinnertime, the appetizer lineup expands, and the kitchen adds some exotic pizza toppings to the array. Desserts come from neighboring Buttercream Bakeshop. A limited cocktail list, more extensive beer and ale choices, and the wine selections are worth a hard look.